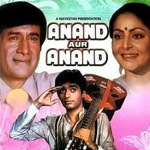 "Anand Aur Anand" is a 1984 hindi film which has Dev Anand, Sunil Anand, Raj Babbar, Rakhee, Smita Patil, Natasha Sinha, Rakesh Bedi, Biswajeet, Birbal and Sudhir in lead roles. We have 2 songs lyrics and 2 video songs of Anand Aur Anand. R. D. Burman has composed its music. Kishore Kumar and Asha Bhosle have sung these songs while Anjaan has penned its lyrics.